Front Office Position: Owner, Chairman of the Board, Chief Executive Officer and President. Acquired: Pittsburgh's first round draft choice, first overall in 1984 Entry Draft. 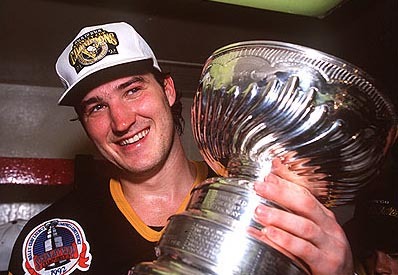 Mario Lemieux is the everlasting symbol of the glory days of Pittsburgh hockey, culminating with Stanley Cup championships in 1991 and 1992. He is the leading scorer in Penguins history and when he retired in 1997, he was the No. 6 all-time scorer in NHL history with 613 goals and 881 assists for 1,494 points. His career highlights include six league scoring championships, three MVP awards, two Conn Smythe Trophies as MVP of the playoffs (1991 and 1992) and the Calder Trophy as rookie of the year in 1984-85. And he accomplished all of these feats despite a stunning series of medical setbacks, including a bout with cancer in 1993 and two major back operations. First NHL Game: October 11, 1984 - in a 4-3 loss at Boston. First NHL Point: October 11, 1984 - a goal in a 4-3 loss at Boston. First NHL Goal: October 11, 1984 - in a 4-3 loss at Boston vs Pete Peeters. Most Goals, Game: 5 - Dec. 31, 1988 in an 8-6 win vs New Jersey, April 9, 1993 in a 10-4 win at NY Rangers and Mar. 26, 1996 in a 8-4 win vs St. Louis. Most Assists, Game: 6 - Oct. 15, 1988 in a 9-2 win vs St. Louis, Dec. 5, 1992 in a 9-4 win at San Jose and Nov. 1 , 1995 in a 10-0 win vs Tampa Bay. Most Points, Game: 8 - Oct. 15, 1988 in a 9-2 win vs St. Louis (2g,6a) and Dec. 31, 1988 in an 8-6 win vs New Jersey (5g,3a). Most Penalty Minutes, Game: 24 - Nov. 26, 1988 - in a 4-3 win vs Philadelphia. Appeared in 10 games with the Penguins. Missed the final 72 games following hip surgery. Recorded his 1,700th NHL point Oct. 29 vs. NY Islanders. Recorded nine points in 10 games. Recorded two points Oct. 11 @ Philadelphia, his 221st career two-point game. Appeared in 67 games, the most since the 1996-97 season. Led the team in scoring with 91 points. Led the team in goals, assists, power-play goals and was tied for first with four game-winning goals. Ranked eighth in the NHL in scoring, third in assists, tied for tenth in power-play goals, third in power-play assists and ranked second in power-play points. Recorded 27 multiple-point games. Became the tenth player in NHL history to record 1,000 career assists on Feb. 8 @ Boston with a four-assist game. Named NHL Player of the Month for the month of November, recording 23 points, his 24th Player of the Month Award. Named the starting center for the Eastern Conference at the 2003 NHL All-Star Game, the eighth time of his career he was named a starter to the game; missed the game due to injury. Recorded four assists Feb. 8 @ Boston, including his 1,000th career assist. Scored the game-winning goal in overtime Feb. 18 vs. Edmonton, his 11th career overtime goal, tying for third all-time. Recorded 31 points, appearing in only 24 games. Ranked sixth on the Penguins in points, fifth in assists, second in power play assists and tied for fifth in power play points. Became the seventh player in NHL history to record 1,600 points with two assists Feb. 27 vs. Los Angeles. Moved into seventh place on the NHL all-time scoring list, passing Phil Esposito, Jan. 23. Collected four assists Jan. 21 vs. Philadelphia, the 26th four-assist game of his career. Recorded five points), his 36th career five-point game, Jan. 23 vs. Tampa Bay. Captained Canada to a Gold Medal in the 2002 Winter Olympics, recording six points in five games. Tied for first on Team Canada in assists and tied for second in points. Tied for fifth in overall Olympic scoring and assists. Announced he would return to the Penguins as a player Dec. 11. Practiced with the team for the first time Dec. 19. Played in his first game Dec. 27 vs. Toronto, collecting three points (1+2), recording an assist just 33 seconds into the game. Ranked fifth on the Penguins with 76 points, despite playing in only 43 games. Was runner-up to Joe Sakic in voting for the Hart Trophy as league MVP, was a finalist for the Lester B. Pearson Award as NHLPA MVP, and was named to the NHL Second All-Star team, his ninth such selection (five - First team, four second team). Ranked third in the league in shooting percentage (20.5%). Had the second most points in the league from the time of his comeback to the end of the season (Jagr - 84 points). Had a point in 37 of his 43 games (86%), going scoreless in back-to-back games once (Feb. 17 at Columbus and Feb. 19 vs. Colorado). Became the 14th player in NHL history to record 900 assists Feb. 25 vs. the Islanders. Notched his 1,500th career point with an assist Dec. 20 vs. Ottawa. Scored his 10th career overtime goal to set a club record Feb. 21 vs. Florida. Notched his 40th career hat trick Jan. 24 vs. Montreal to rank second all-time. Named NHL Player of the Month for January, his 13th such selection, collecting 25 points in 14 games. Had seven multi-goal games and 16 multi-assist games. Was the only player among the top 10 playoff scorers who did not appear in the finals. Tied for eighth in the league in goals, tied for sixth in assists, tied for fourth in power play assist (5), and tied for first with three game-winning goal. Is the Penguins career playoff leader in goals (76), assists (96), points (172), and power play goals (29). Retired (the first time). His #66 was retired by the Pittsburgh Penguins. Five months after his retirement, inducted into the Hockey Hall of Fame in November 1997, as the customary 3-year waiting period was wavied. Won the Art Ross Trophy for the sixth time, leading the league with 122 points. Named to the NHL First All-Star team for the fifth time in his career. Was his 10th career 100-point season, second most in NHL history (Gretzky Ð 15). Tied for third in the league in goals and tied for first in assists. Tied an NHL record scoring four goals in the third period Jan. 26 @ Montreal. Named NHL Player of the Month for January, recording 26 points in 11 games. 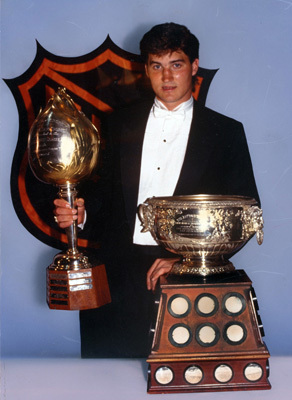 Won his third Hart Trophy as the NHL's Most Valuable Player, become one of only seven players in league history to win the Hart Trophy at least three times. Led the NHL in scoring with 161 points, the fifth time in his career that he has captured the Art Ross Trophy. Is only one of four player in NHL history to win the scoring title five-or-more times. His 161 points was his third highest total ever and the 12th highest total in league history. Was his ninth career 100 point season, second only to Wayne Gretzky's record of 15. Was named to the NHL's First All-Star Team for the fourth time in his career. Led the NHL in goals (69) for the third time, his fifth season with 50-or-more goals. Was his fourth season with at least 60 goals, which ties him with Phil Esposito for the second most in NHL history, trailing Mike Bossy and Gretzky, each with five seasons with 60-or-more goals. Finished the season tied with Ron Francis for the league lead in assists (92), the fifth time in his career that he has recorded more than 90 assists. Led the NHL in power play goals (31), which was tied for the third highest single-season total in league history. This also tied a club record for the most in one season and is the only player to record over 30 power play goals in two different seasons. Also led the league in power play assists and points and in short-handed goals. Tied his club record for goals in a game, scoring five on Mar. 26 vs St. Louis. Recorded a point in 63 of his 70 games, including 43 multiple point games and six hat tricks. Became the 20th player in league history to score 500 goals on Oct. 28 at NY Islanders and the second fastest (Lemieux in 605th game/Gretzky in 575th game). Recorded his 37th career hat trick, placing him third on the all-time list (Gretzky - 49; Bossy - 39). Recorded a point in 15 of 18 playoff games, including eight multiple point games. Recorded four assists on Apr. 22 at Washington, to tied a team playoff record for the most assists in a game. Announced on Aug. 29, 1994 that he would take a medical leave of absence and not play during the 1994-95 season. On June 20, 1995, announced that he would return to the ice to play the 1995-96 season with the Penguins. Missed the first 10 games of the season, after having surgery on July 28 to repair a herniated muscle in his back. Returned to the lineup on Oct. 28 vs Quebec, recording two assists. Recorded 37 points in only 22 games played. Won the Hart Trophy for the second time in his career. Despite playing in only 60 games, won his fourth scoring title, recording 160 points, the third highest point total of his career. Was named to the NHL's First All-Star Team at center. Was selected as the Bill Masterton Trophy Winner as the player who best exemplifies the qualities of perseverance, sportsmanship and dedication to hockey. Also was selected as the Lester B. Pearson Award Winner. Finished third in the NHL with 69 goals and had the best goals-per-game average in the league (1.15). Finished the season fourth in assists with 91, the fourth time in his career that he recorded 90 or more assists. Had a points-per-game average of 2.67, which is the third highest in NHL history. Led the NHL with a plus 55. Recorded a point in 54 of his 60 games and at least two points in 48 games. Set a club record for the most game-winning goals in a season with 10. The Penguins announced on Jan. 12 that he was diagnosed with a Nodular Lymphocytic form of Hodgkin's disease, which diagnosed in an early stage, is the most favorable type and is cured in most people. The diagnosis was made after the removal of an enlarged lymph node from his neck. Treatment in the form of radiation began on Feb. 1 and ended on Mar. 2. Skated with the team for the first time after the treatment began on Feb. 12. Returned to the lineup on Mar. 2 in Philadelphia, recording two points in a 5-4 Pittsburgh loss. Recorded at least one point in 18 of 20 games after returning to the lineup, totaling 56 points. Had a season-high 16-game scoring streak from Mar. 9 to April 9, recording 51 points. Scored a club record 18 goals in the month of March. Recorded back-to-back four-goal games (Mar. 18 vs Washington & Mar. 20 vs Philadelphia) and a club record-tying five-goal game, April 9 at NY Rangers. Led the team with 18 points in 11 playoff games, finishing tied for ninth in NHL playoff scoring. Won his third scoring title, recording 131 points. Despite playing in only 64 games, ranked second in assists and tied for seventh in goals in the league. Was named Pro-Set NHL Player of the Year. Recorded his 1,000th career point in career game number 513, on Mar. 24 at Detroit, to become the second fastest player to record 1,000 points in NHL history (Gretzky - 424). Ranked second on the team with a plus 27. Won Conn Smythe Trophy for second consecutive year as MVP of the Playoffs, leading the league in points (34), goals (16), power play goals (8) and game-winning goals (5), despite missing six games in the Penguins run to a second straight Stanley Cup. Tied an NHL playoff record for the most game-winning goals. Set a club playoff record with eight power play goals. Recorded six points on April 23 vs. Washington, including an NHL playoff-tying four point period. Became the first player to record four points in a period during a playoff game on two occasions (April 25, 1989 vs Philadelphia). Missed the first game of the playoffs with a shoulder injury and missed five other games with a broken left hand suffered (slashed by Adam Graves) on May 5 at the NY Rangers in Game Two of the Division Finals. Missed the first 50 games of the season, recovering from July 11 back surgery to remove a herniated disc. Returned to the lineup on Jan. 26 at Quebec, recording three assists. Won the Conn Smythe Trophy as the Playoffs Most Valuable Player, leading the league in playoff scoring with 44 points and leading the Penguins to the franchise's first Stanley Cup. Also led the playoffs in assists with 28 and was tied for second in goals with 16. Recorded a point in 22 of the 23 playoff games. Despite missing 21 games due to back problems, finished fourth in league scoring with 123 points. Recorded a 46-game scoring streak from Oct. 31 to Feb. 11, the second longest streak in NHL history, and tallied 103 points during the streak. Won his second straight scoring title, recording 199 points. Ranked first in goals with 85 and tied for first in assists with 114. His 85 goals were the third highest total in a single season in NHL history and became the second player (Gretzky) to record 70 or more goals in two different seasons. Became only the third player (Orr & Gretzky) to record over 100 assists in a single season in league history. Set a single season NHL record with 13 short-handed goals. Led the NHL with 31 power play goals. Was involved in 57.3% of the team's goals, the highest percentage in league history. Became the team's all-time leading scorer on Jan. 20 at Winnipeg, recording his 715th point, passing former Penguin Rick Kehoe. Set a club record for goals in a game with five on Dec. 31 vs. New Jersey, becoming the first player in NHL history to record an even strength goal, power play goal, short-handed goal, penalty shot and empty net goal in the same game. Named to the NHL First All-Star Team and was named Dodge NHL Performer of the Year. Tied an NHL record for points in a playoff game with eight Apr. 25 vs. Philadelphia. Captured the Hart Trophy, as the NHL's Most Valuable Player, as well as winning the Art Ross Trophy as the league's leading scorer. Recorded 70 goals, 98 assists and 168 points, became only the fourth player in NHL history to score 70 goals in a season. Led the league in goals and short-handed goals (10) and finished second in assists. Led the NHL and set a club record with 382 shots on goal. Won the Lester B. Pearson Award and was named the Dodge NHL Performer of the Year. Despite playing in only 63 games, still led the team in goals (54), assists (53) and points (107). Was tied for third in the league in points and goals. Finished second in the league in scoring with 141 points. Led the team in goals (48) and assists (93), and had a 28-game scoring streak from Jan. 11 to Mar. 15, recording 59 points. Finished second in the Hart Trophy voting, while being named to the Second All-Star Team, but won the Lester B. Pearson Award as the league's best player as voted by the players. During his rookie season, became only the third rookie in NHL history to record 100 or more points in a season. Won the Calder Trophy as Rookie of the Year and was named to the All-Rookie Team. Scored a goal in his first game on his first shift and on his first shot on Oct. 11 at Boston vs. Pete Peeters. Still holds the club rookie records for the most goals (43), assists (57) and points (100) in a season. In his final season with Laval (QMJHL), was named Canadian Major Junior Player of the Year, recording 282 points (133+149)... Holds the junior record for the most points (282) and goals (133) in a season... Ranks second in assists (149) in a season... Set a junior record scoring in 61 consecutive games. 2002 Winter Olympics: Captained Canada to a Gold Medal, recording six points in five games. Tied for first on Team Canada in assists and tied for second in points. Tied for fifth in overall Olympic scoring and assists. 1987 Canada Cup: Playing for Team Canada, led all players with 11 goals and finished second in points with 18, helping Team Canada win the tournament. 1985 World Championships: Was named to the All-Tournament team... Scored two goals in Team Canada's 3-1 victory over the USSR, Team Canada's first win over the USSR since 1961. 1983 World Junior Championships: Playing for Team Canada, was his team's second leading scorer in the tournament held in Leningrad, recording 10 points (5+5)... Team Canada won the Bronze Medal. Mario and wife Nathalie have four children and makes his home in Pittsburgh year-round. Enjoys golf and has played on the Celebrity Golf Tour. Has served as honorary chairman for the Pittsburgh Cancer Institute, and is President of the Mario Lemieux Foundation.